"Thank you for all of your help with the wedding and patience with my endless questions. We couldn’t have asked for a better day, everything ran so smoothly and even the weather cooperated. You really made the planning easy and your recommendations for florist, DJ, spa and make up were excellent. All of our guests loved the location and we received nothing but compliments on the food. I was told by one guest it was the best wedding buffet they’d ever had! The Poutine was also a hit. Our New Zealand family were thrilled when the bear ran under the chairlift….I’m not sure which one of you arranged that but kudos to you!" 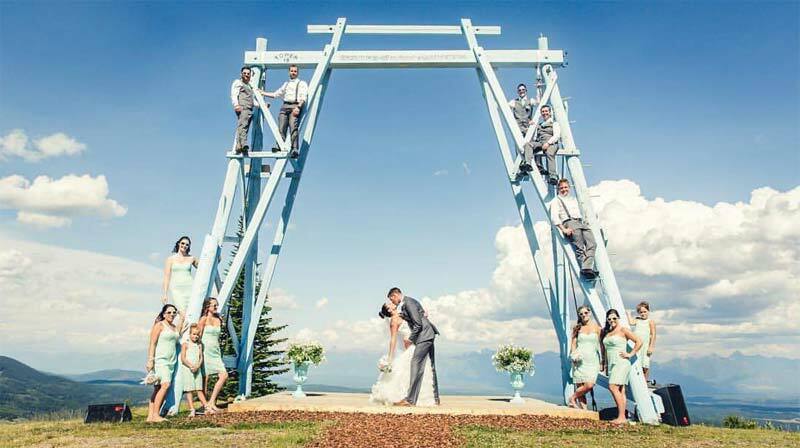 The beautiful award winning Trickle Creek Golf Course located 3 minutes from the resort village is a wonderful venue to host your wedding rehearsal dinner. The golf course’s natural outdoor setting and magnificent flower baskets offer a romantic place for you and your guests to enjoy. The restaurant and lounge located in the Trickle Creek lodge in the center of the resort village is another rehearsal dinner option to consider. The restaurant follows the village blueprint for décor; with a plethora of pine log work and etched glass work.